Because of the diversity of its land, Peru is one of the countries offering the most opportunities to do adventure sports. And one which has been becoming more and more popular is Trekking. This is activity involves walking long stretches of uneven surfaces which allow for the development of muscle strength and resistance, in addition to enriching the view with alluring natural landscapes. One of the best natural routes for Trekking lovers is the Royal Inca Road in Cuzco, which as opposed to the traditional Inca Road allows for arrival in Machu Picchu in just two days. Many travel agencies include among their adventure tours the route to the Royal Road in addition to surrounding places, such as the archeological sites of Choque Suysuy, Wiñay Wayta, Intipata and Intipunku. During the two days of walking you must carry a small backpack with changes of clothes, which include a hat, short sleeve shirt and shorts during the day; and chullo (wool hat), jacket and double pants for the night. Also bring sun block, sunglasses, sleeping bag and several water bottles. To rest from the weight, one can hire the services of porteadores or huayruros – men that live around the road and can carry the provisions for a small fee. 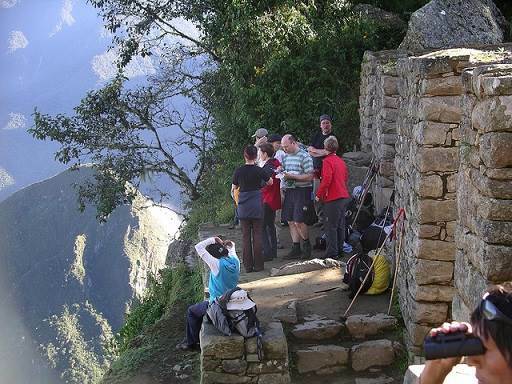 The visit to the Royal Inca Road is recommended between the months of June and August, since during the rest of year the rains cause mud on the road and make it harder to travel, especially considering its closeness to the abyss. Before taking on the trip it is recommended to get used to the area for a period of 72 hours, chewing coca leafs or drinking “mates,” so as to avoid altitude sickness. On the first day of walking, drink lots of water and ingest few solids so you avoid dizziness, stomachaches or fainting.